Just about all of you reading this know that I am a technical writer. One of the things I do to keep up to date with the latest trends in the field is read. I read books, articles, blogs, whatever I can find that relates. I especially enjoy Mark Baker’s blog, Every Page is Page One. Baker consistently posts articles that make me think, and in good ways. When I heard he has a book out, I contacted the publisher immediately. As a side note, Baker’s publisher, XML Press, consistently produces books that I find useful. Every one I have read is well-written, authoritative, and filled with real-world experience and practicality. 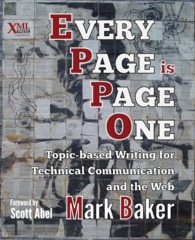 Every Page is Page One: Topic-based Writing for Technical Communication and the Web shares the first part of its title with the blog, but the content is not directly from the blog. Rather than a collection of posts on assorted topics assembled into book form, this is a well-thought-out and well-organized text. In it, Baker observes that documentation projects tend to think about technical writing from a very book-centered paradigm. This was once ideal, but in the age of communicating technical information electronically, it forces limits on the end product that hinder the true goal of technical writing, the goal of delivering the right information at the right moment to the person who is seeking it. As someone who is not only a technical writer, but who also has a degree in information resources and library science, I have multiple reasons for supporting this goal. What Baker does is give tangible form to thoughts and ideas that he, other technical writers, and even I have had in the abstract. How do we provide needed information to people who seek it in an age where the web makes almost anything searchable? Do manuals still matter? What about other forms of documentation? Are there changes to our style of communication, to our style of writing and presenting information, that will make the information seeker’s task easier? Baker discusses serious and realistic ways we can improve our field. It is all organized around the idea that we can no longer control the order in which information seekers will consume or even find our information, that every page (in a documentation wiki, for example) should be created in a way that enables a user to immediately understand and acquire what they need when they need it. Since we know we do not have this control like we had in a printed book, we must modify how we write and present information to fit the expectations of the seeker. I enjoyed reading this book. I have benefited personally from reading this book. I am taking this book in to my workplace and sharing it with the other tech writers there and I believe our workplace and our employer and our customers will benefit from this book. If you work in the field, I’m convinced you will, too. The whole book is good, but my favorite parts are Section I, which lays the foundation in five chapters, and Chapter 22, which gives very practical and useful advice for making your case to others when you begin to try to make the changes the book describes. Nice review, Matthew! As someone who struggles with technical writing (I can’t help but add adjectives where they don’t need to be) this sounds like it could be useful.